Welcome to the show! Over the next couple of hours I’ve got lots of lovely tunes coming up on the show this evening with a few particular focusses. We check out the New Canadians - mostly of African origin - as well as some Quebecois folk from French-speaking Eastern Canada. We keep folky with music from Wales and the UK, check out a few more Womad acts and bring some Brazilian warmth and sunshine to our changeable British Summer. Finally WorldBeatUK takes a fresh look at the Fab Four (yes, that Fab Four!) reinterpreted in a plethora of styles and we end with a welter of remixes, refixes and general mashups - with a few surprises thrown in for good measure - so make sure you stick around till the end of the show. So, let’s start at the top and go to Canada. 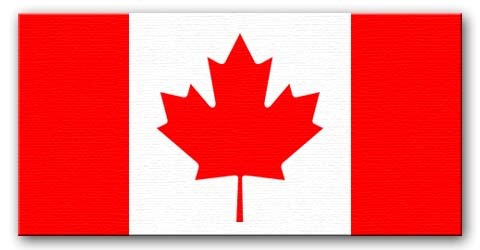 Forget Mounties and Lumberjacks, the New Canadians are a disparate bunch from all over the world, including latinos, Punjabis and Africans. 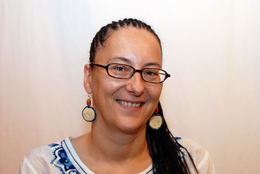 Whilst out at the Womex exhibition last year in Copenhagen I met up with a fascinating woman called Nadine McNulty who is both radio DJ in Toronto (for CIUT FM) and a promoter of African music. She pointed me in the direction of some of Canada’s new residents and their music. I’ve played a few over the past few weeks including Cheka Katenen Dioubate and Saa Andrew Gbongbor, but I’m going to showcase a few more this week from East Africa, West Africa and Southern Africa. 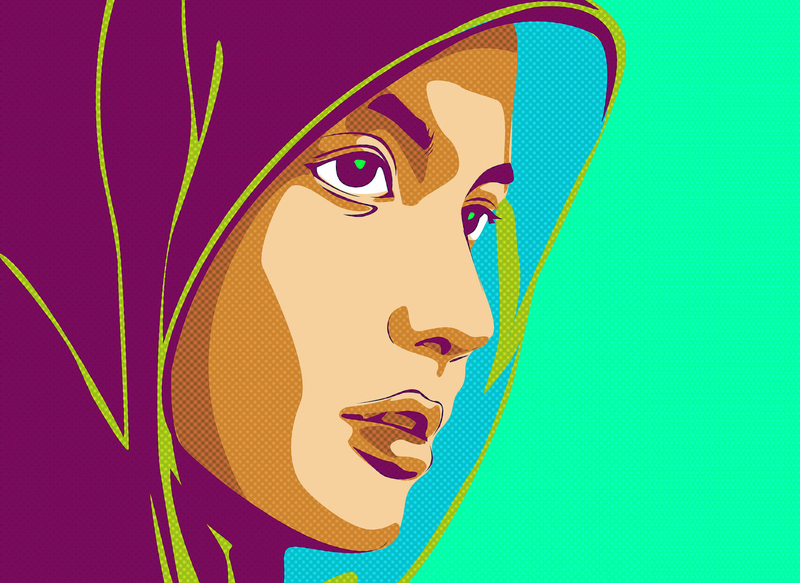 First off is an artist described as "Toronto’s Krar Star”, Daniel Nebiat. Now, the krar is an East African instrument best described as a 5 or 6 string lyre, that is: a small hand-held harp. Daniel Nebiat is originally from Eritrea that small country that lies along the coast of the Red Sea near the Horn of Africa and which only regained its independence from Ethiopia in 1993 after a 30 year war. Nebiat describes his music as a mix of Eritrean Country and New Country - but don’t be thinking stetsons, cowboy boots and Hawaian slide guitars! 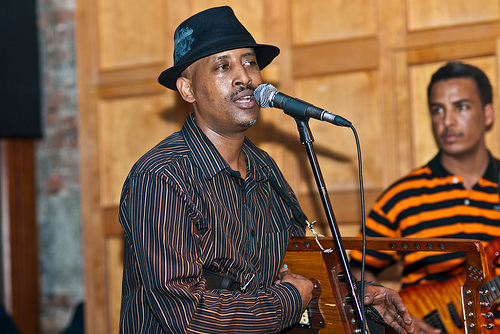 The music mostly features traditional grooves in 6/8 time and is sung in Tigrinya, with support from the Sudanese Waleed Abdulhameed on bass amongst other things. 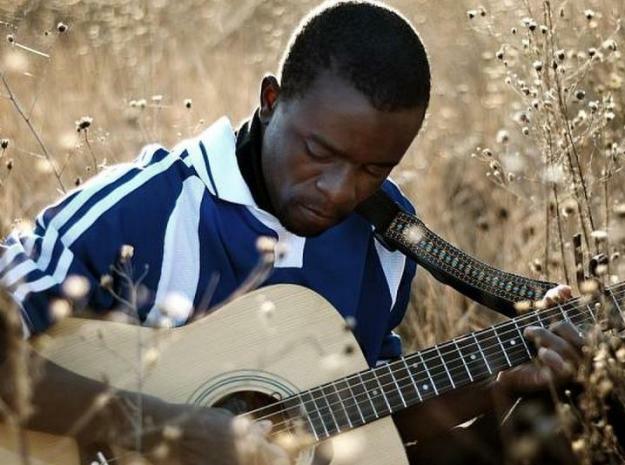 2 "Hakimey" 7:32	Daniel Nebiat "Hakimey"
Another African emigrant was guitarist, singer and composer Tichaona Daniel Maredza who only arrived in Toronto in 2008 from his native Zimbabwe. As his publicity has it: “swooping down from the vast Zimbabwean plains … a guitar in one hand, a drum in the other and an mbira in his teeth”. 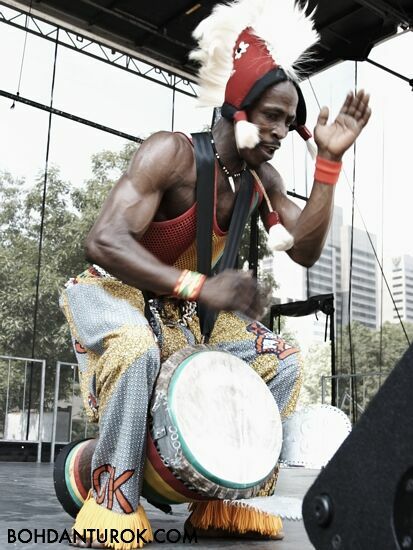 This is the last of my New Canadians now - originally from Guinea in West Africa, the djembe drummer Mohammed Diaby started off at age seven and has had a full career since the age of fifteen as lead drummer with various dance groups and dance ensembles. The track I’m going to play here is from his 2007 album “Ala Na Na” (ie God Is Here) and is called “Yamama”, Yamama being a mask dance from the Samou region of Guinea utilising a rhythm of the Mandenyi people. OK, from Canadian African music to French Canadian music. 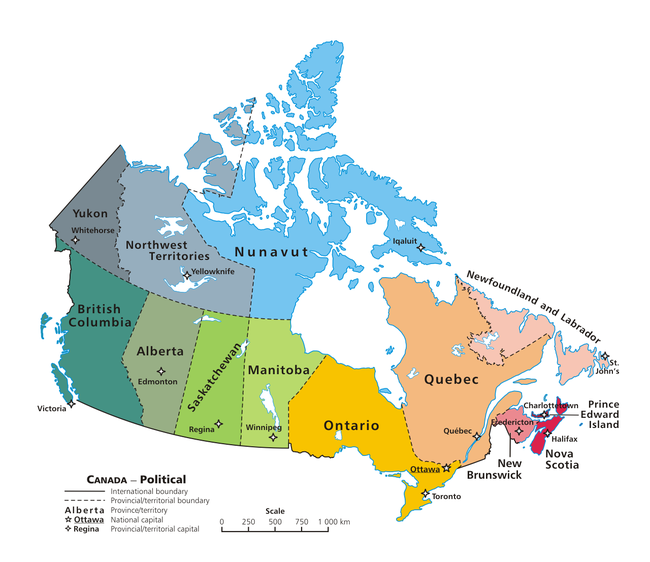 Canada is almost two countries in one: the majority English speaking part and the Eastern French-speaking Province of Quebec whose inhabitants (les Quebecois) hold passionately onto their French language and francophile culture. And from that Francophone area we derive the next act. 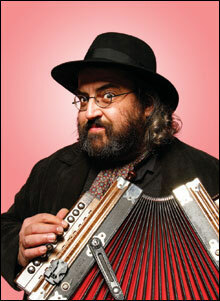 The accordionist Yves Lambert is almost a living legend in Quebecois folk music both solo and for his 26 tenure with the cult band La Bottine Souriante and since 2004 with the Bebert Orchestra. However the track I’m going to play is from his Trio Yves Lambert which utilises just two other members of the Bebert Orchestra: Guitarist Olivier Rondeau and the fiddler and mandolin-player, Tommy Gauthier. This is a foot-stomping folk-tune called “Le Pere Tanasse”. We’re going to segue from Canadian Folk to British Bluegrass! 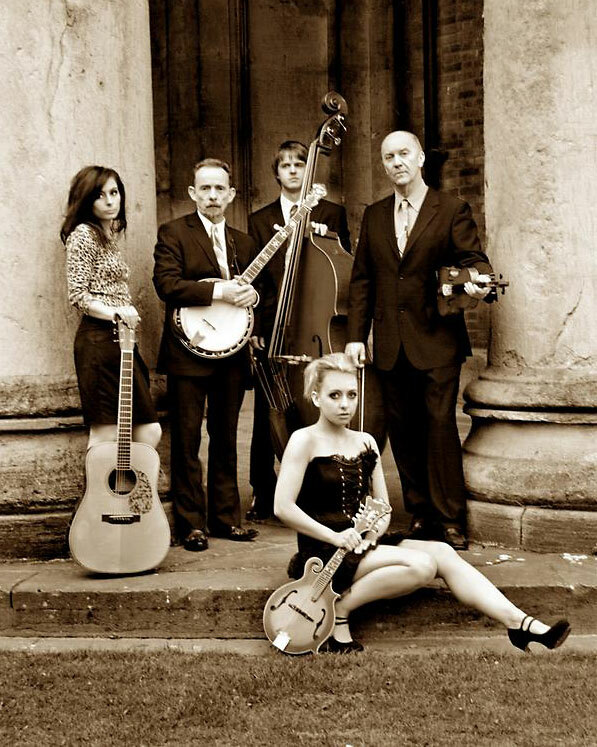 And in this case Birmingham’s very own acoustic bluegrass family the Johnsons, aka The Toy Hearts: Dad Stewart Johnson on dobro and banjo and his two daughters (now fronting the band), Sophia (on flatpicking guitar and vocals) and Hannah (lead vocals and mandolin). The Toy Hearts have been gaining a lot of critical acclaim recently including from the ‘new rockabilly Queen’ Imelda May and legendary broadcaster ‘Whispering’ Bob Harris amongst others. This is a single they released in October last year and it’s called “Femme Fatale”. Catch them while you can . . . Staying in the UK we’re going over now to the Inter-Celtic folk band Mabon (who - as the newly reformed ‘Jamie Smith’s Mabon’) will be playing live at Womad this weekend at the Radio 3 Stage - check ‘em out if you’re going). So here’s a track from the original Mabon line-up taken from their award-winning 2010 Live album “Live at the Grand Pavilion” (on the Easy On The Records label). This is one’s called “Fiddlers Despair”! 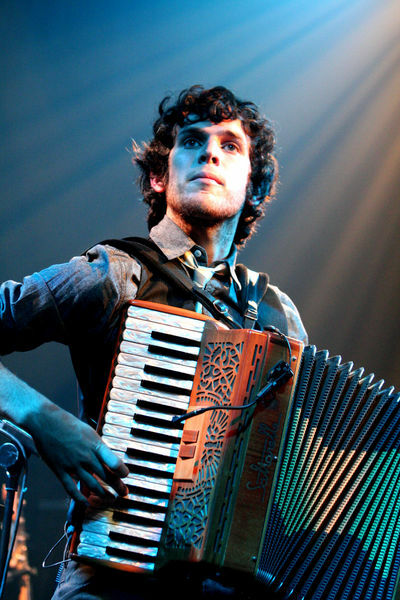 (even though there’s nary a fiddle to be heard - and it features Jamie’s Smith’s accordion). Either way, it’s guaranteed to get you bouncing up an down in your seat! Sticking with the Welsh Womad connection this is a less traditional take on Welshness and Celtic identity. The band are called 9bach - but I’m not sure whether that should be pronounced as 9bach (with an English 9) or Nawbach (‘now-bach’) with a Welsh pronunciation of the number 9. Anyway, their music has been described as Portishead meets early Fairport Convention, acid folk, ‘dungeon dark psych-folk’, folktronica and even ‘pastoral yet sinister’ and ‘attractive yet disturbing’. Hmmm. You can make up your own minds on this one. They sing in Welsh (or should I say Cymraeg) and usually feature the voice of Lisa Jen. This track is from their 2009 album “Gwymon” and is entitled “Bythyn fy Nain” which translates as “Bythyn, my Grandmother”. 9bach/NawBach will be performing at Womad in Charlton Park this weekend and if you miss them they’ll also be appearing at the Moseley Folk Festival in early September this year. 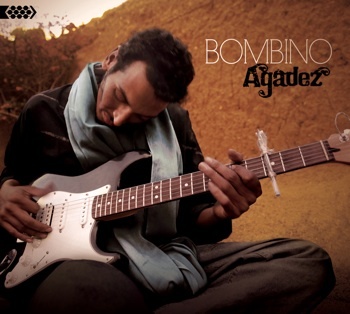 Also at Womad this year is Saharan desert rocker Bombino from Niger - I’ve played both him and this track before - but it’s good enough to play again. 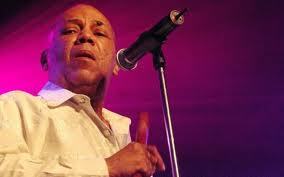 Now some of you maybe aware that the great Colombian singer Joe Arroyo passed away yesterday at the age of 55 in Barranquilla after struggling with multiple organ failures. I’ve written a full obituary of Joe for the website WorldMusic.co.uk (www.worldmusic.co.uk/joe_arroyo_dies_in_colombia_26711) under the News section - so you can read that for a more in-depth appreciation of his life and work. 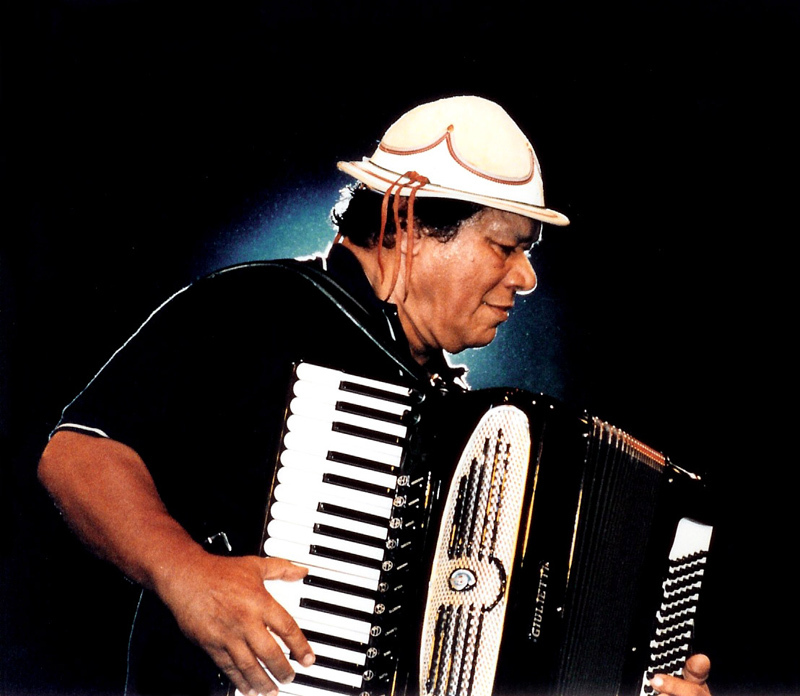 Suffice to say that the latin world and tropical music in general has lost a true original and an amazing artist. 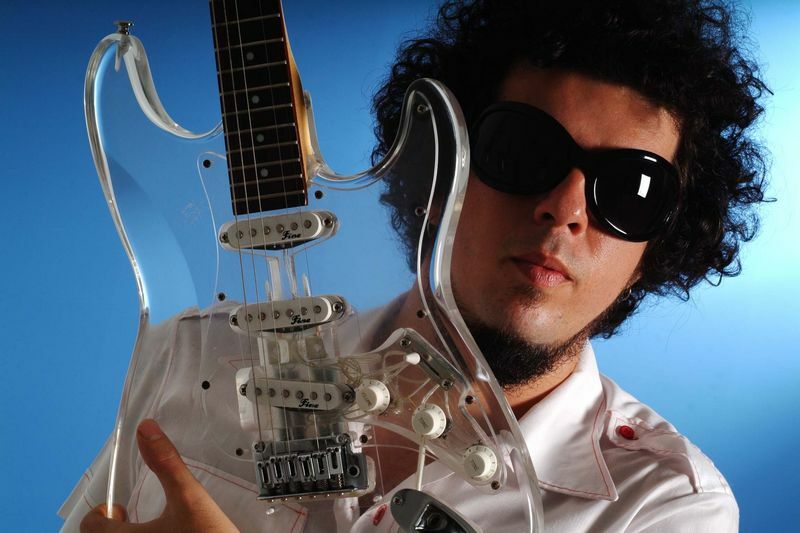 With scores of hits to his name, both with Fruko y sus Tesos and the Latin Brothers as well as his own band La Verdad, Joe wrote the soundtrack to his life. RIP Joe Arroyo who died yesterday. Let’s stay in latin america for the next few tracks, but this time we’ll head south to the vast country of Brazil. We might not be getting all the sun and warmth we think we deserve in this country, but just close your eyes, listen to this music and you can almost feel that tropical tingle on your skin! Don’t forget you’re tuned into Rhubarb Radio and listening to WorldBeatUK with me Glyn Phillips, your host for two hours of fantastic music from around the world. You can hear WorldBeatUK every Wednesday between 7pm and 9pm (UK time) by logging onto www.rhubarbradio.com and I’ll bring you my own eclectic selection of old hits, new releases and ones that got away! You just heard the a track called "Sunshine (Simples Canção)" by the Brazilian Alexandre Lima e Radio Experienza from his rather awkward but intriguingly entitled album “Meu Apartamento É Pequeno Mas Tenho O Lado De Fora Para Andar” (which translates as ‘My apartment is small, but I have the outside bit to walk around in’!). Ok, let’s leave Brazil now and head into a section of the show that I’ve been planning for a few months now - gradually building a library of tunes I can use in it. This is all about the Fab Four! Yep, that Fab Four - Los Beatles - The Beatles. Yes, you might well ask, what are they doing in a world music show? Isn’t that stretching the boundaries a bit? But folks, this is ME we’re talking about! You don’t think I’m going to give you the originals do you? No, no, no! Tish, tish! I’ve lined up half a dozen different versions and mashups that might have you either applauding or wincing in turn. I’ve no idea. But I like them! 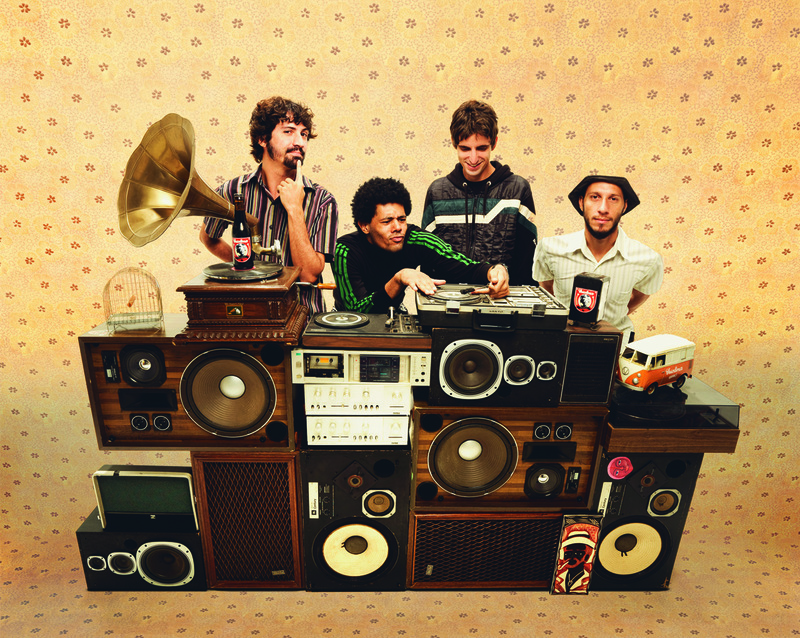 First up we go to Venezuela and one of their great ska bands (yes, Venezuela does have great ska bands!!). 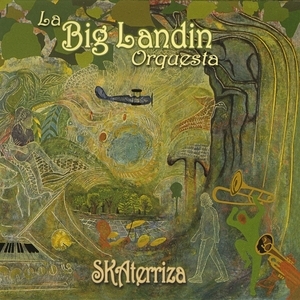 This is La Big Landin Orquesta and from their album “SKAterriza” an early Beatles tune called “I Should Have Known Better”. Yeah, ha ha! Well I liked it: "I Should Have Known Better" performed by Venezuela’s Big Landin Orchestra. Incidentally when that was released by the Beatles it became a Number 1 in Norway in 1964. Now inevitably this leads me onto the appalling murders in Norway last week. We can only imagine the horror of such events. It still seems unreal. Just like the States after 9/11, Norway is in a state of shock and fear. And this is the time for people to reach out to others. 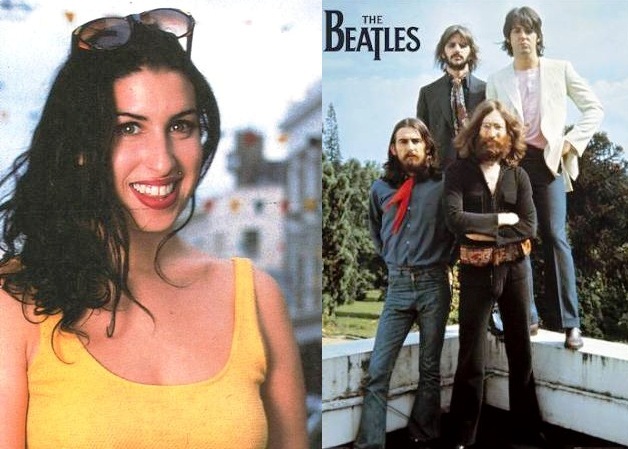 This might seem hard to believe, but I’d already programmed this next track into my show the week before the news came out about Oslo and Utoeya and also about the death of Amy Winehouse. So please don’t think I’m cashing in with this one - it’s pure coincidence but I think a very valid contribution to the show. Well there you had a dubstep version of The Beatles’ “Eleanor Rigby” remixed by 4Centers. A timely reminder to care for the distressed, mentally ill and lonely. 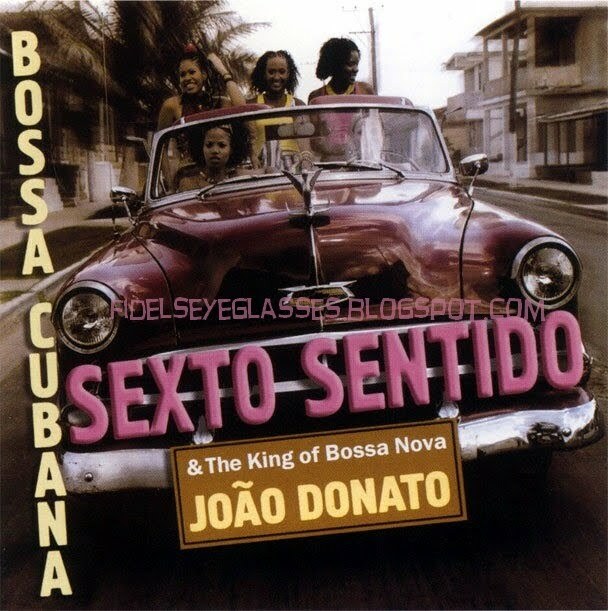 From a song of sadness and loneliness and neglect, to one of love and beauty - “Michelle” - and especially this treatment of it by Sexto Sentido. Anyone that’s heard me play any music by these four Cuban women will have heard me wax lyrical about them. I just love them. And this tune if ever there was, is a balm for the soul. It’s as if honey was made into music. Was that not just perfection on a plate? I defy any vocal group to do better! Aaaaaah! OK, sticking with The Beatles theme still for another couple of numbers this is another tune I love and a version which I think equals the original. Wasn’t that good? Final one now in The Beatles themed section of the show. 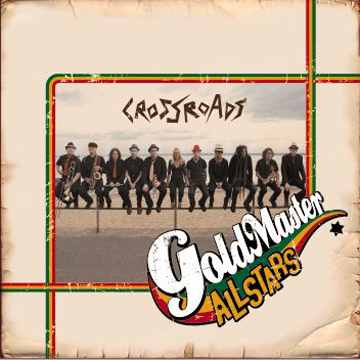 This is a band I played last week for Lucy, the Easy Stars All Stars but this time featuring Luciano on vocals. Here’s something that we could all do with: a little help from our friends . 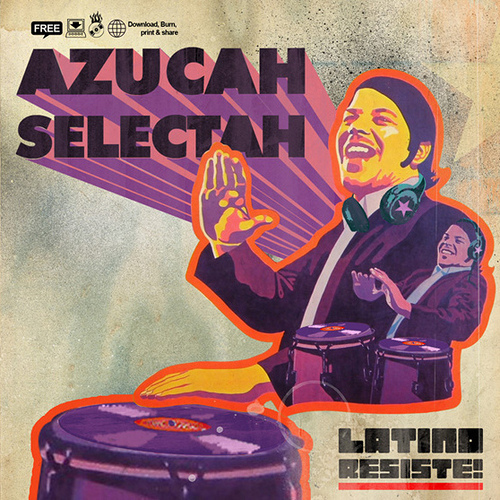 . .
Change of pace now and three remixes in the styles of Latin Funk, Baile Funk and Reggae. 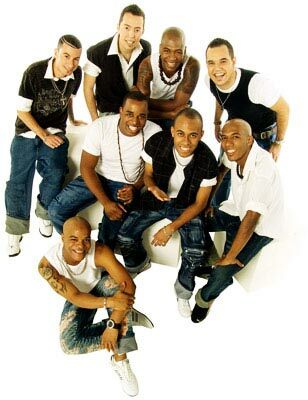 First one is a tune that was well known to any salsero in this country at least who was around in the 90s. Let’s rack it up a gear again. All the way from Vilnius, Lithuania in the Baltic come the 21 year old remixer Karolis Rimkus aka Ophex. 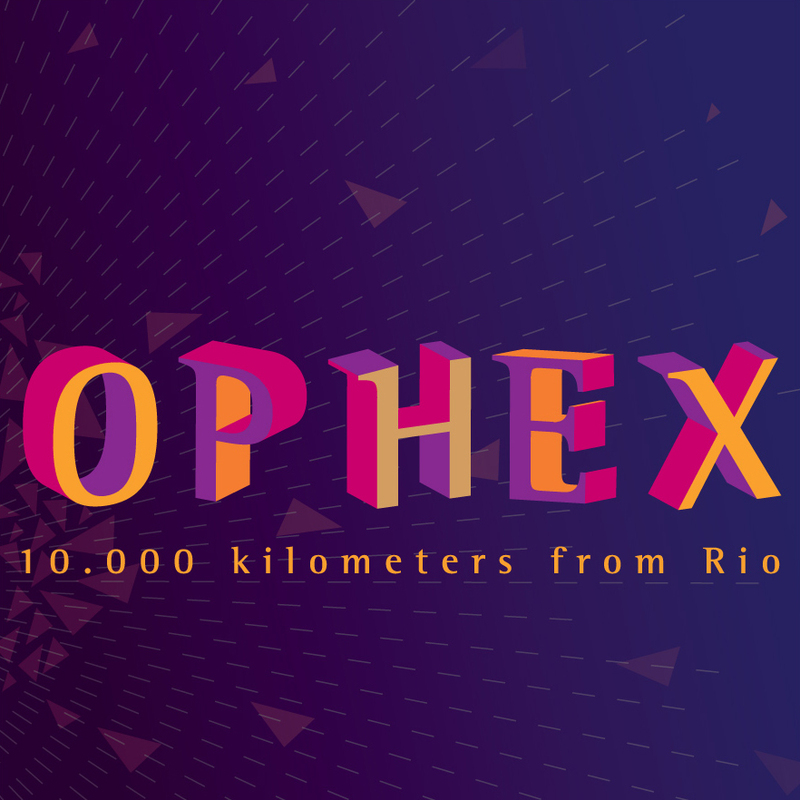 This is a piece of what is I suppose Lithuanian folk put through Ophex’s kitchen blender and inspired by baile funk from the favelas of Brazil. It’s certainly different! 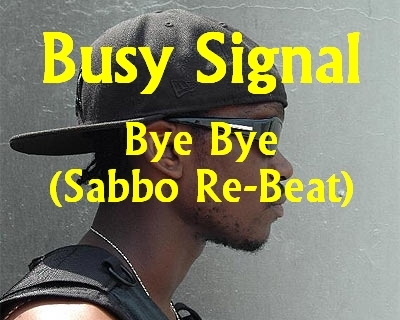 This is a remix by Sabbo of the Everley Brothers hit “Bye Bye Love” mashed up with lyrics from Busy Signal. Just enough time hopefully to squeeze this one in. 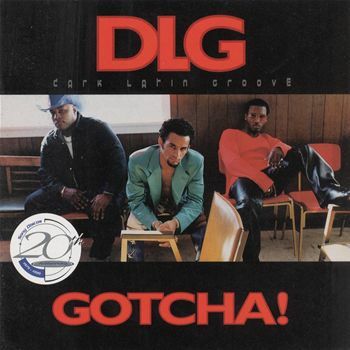 DLG and a lovely bachata called “Eres Mi Vida”. (12) 24 "Eres Mi Vida" (4:52)	DLG	"Gotcha"